The boy's behaviour...: No, you can't make me and I will not! How do you deal with ‘NO’ in your house? I ask, because we could really do with some help in our house at the moment. You know that phase where all toddlers begin to overuse the word ‘No’. Well, either Dollop has yet to hit that phase, or we’ve been lucky. I’m keeping my fingers crossed that we’ve been lucky! However, Mini was going through it when he first moved in, and over the last couple of weeks, has begun to exert his right to use it at every opportunity. The difference is that when he was 13months old and refused to remove his sticky little fingers from the flat screen tv, we could physically remove him. And let’s face it, at 13months, there isn’t much they can do that they shouldn’t, and often they don’t really mean no, they’re just learning words, mimicking and trying to push buttons! But now he’s 5, Mini is stronger, bigger and more strong willed (but still trying to push buttons). What’s that saying – you can lead a horse to water, but you can’t make it drink. And so, we can take Mini to the bathroom, or put him in his bed, or help him get dressed, but it doesn’t mean he’ll wee, or sleep, or stay clothed. Mini says no to anything he doesn’t want to do. This includes weeing, brushing teeth, going to bed, getting dressed, getting undressed, eating, drinking, sitting, standing, getting in the car, getting out the car, watching t.v, playing, sleeping, reading, going upstairs or going downstairs! When Mini is in the right (or wrong, depends on how you see it) mood, he says ‘No’ to almost everything. But the most frequent time of day for this is from around 5pm onwards, and it gets worse when it comes to getting ready for bed. 'No', 'I will not', 'I'm not doing it' and 'no, No, NO!' are the most common things that escape Mini's mouth! It makes no difference whether I ask or tell Mini to do something, the answer is still the same. And it doesn’t matter if it’s me or the NC. Our happy/sad faces used to work. We’d move Mini down onto the sad side, he’d either lose a toy, or go into ‘timeout’. But now, Mini is saying it so often he’d end up at the bottom of the sad side all the time, and that would just be demoralising for him. We try to only use the very bottom of the sad side when we absolutely have to, it is for when Mini has been really really poorly behaved. So, how do we handle the ‘No’? We’re thinking along the lines of not acknowledging it particularly, and using it to try (again) to teach Mini natural consequences – if Mini refuses to go to the toilet before bed, the consequence is possibly wetting the bed. If Mini refuses to come downstairs in the morning, he’ll miss out on breakfast and will be hungry. If Mini refuses to put his pyjamas on, he’ll go to bed in his clothes and get too hot. If Mini refuses to get dressed and put his shoes on, he’ll miss going somewhere nice. We stick our thumbs up and say Good Choice when we get the desired response. We also taught child to say No Problem. This is expected to be their first response to being asked to do something.Only ask one thing at a time. Time to clean your teeth " No problem" . When child says "No!" We walk away saying "That's a silly choice"
Child is nearly 11 and very defiant with a short fuse but we have gone from total defiance to still some defiance. Worth a try? Thanks for your comment - Definitely worth a try. Funnily enough, Dollop (23months) has just learnt to say 'No Problem'. So it might be something that we could easily get Mini saying too - he copies virtually everything else she says/does. It might just take the wind out of his sails. But how long do you give him to learn? 10months into using timeout, and Mini still has not learnt that screaming and hitting mean timeout. Equally though, we've tried using our happy/sad faces to give immediate good and bad consequences to his actions, yet if we give him a consequence for a bad behaviour, 5 minutes later he'll do the same thing, and then 5 minutes later, then 20 minutes later and the next day and the next day. He doesn't learn! I accept that all children like to use 'No', and I accept that some of his actions are natural for his age, but I don't believe that the level of defiance we see in Mini is natural. And I don't believe that the amount of anger behind his 'No' is natural either. We're not just talking about pushing boundaries, or testing us to see if we're consistent - we are - we're talking absolute and utter refusal to do anything asked of him (unless he can see a direct benefit to him!). Thanks for the offer. We'll see how he's doing. How do you get her to stay there? Part of the reason we do time-in with him on timeout, is to get him to stay there - we hold him/cuddle him whilst standing on timeout with him. We've done the continual putting back and 10months on, he still will not stay there! Ry seems to be behaving very simailarly to Mini. When we try to use the consequence rule, he ends up doing the same thing 5 minutes later.. I've lost count of just today how many times i had to stop him trying to jump off the sofa, then having to tell him to sit down for 5 minutes to calm down. Again asking him why je does things, he will say he doesn't know or because he wanted to, even when doing something that could be dangerous. When he does refuse or doesn't listen at all then we tend to ask him if his choice was right or wrong, but again I feel like it doesn't sink in, as the next day he'll repeat the same behaviour.. whn we discuss this with SW , they advise us o keep on reminding him and telling him .. but as you've said Stix.. how long do you keep at it ? we've had Ry for 13 months now and seem to be getting nowhere fast ! We try to ignore it as much as possible and then carry on with an often over-exaggerated routine. I tell him that I think he's made the wrong decision but the choice is his. Obviously this only works when there are no time issues. To be honest the only thing that ever really seems to work in our house with any behaviour is 'ignoring'. It's just not always that easy to be consistent with (on my part). It's hard isn't it...I bite too easily and am pretty sure I couldn't ignore all the time. Plus I don't want Dollop picking up on the same stuff...she's at that age anyway without added encouragement! I would stop using happy/sad face, timeout and any other punishment/reward system - they don't work, they don't address the underlying cause of the behaviour, they disconnect you from your child. Ignoring sends a message of conditional love. I'm amazed at all the advice you've received along these lines, particularly for an adopted child. I haven't had time to read much more of your blog yet - who advised you on these methods? Genuinely interested, not meaning to sound critical. Best wishes. Thanks for your comment. We have been advised to use these methods by our health visiting team, and timeout specifically as part of the Webster-Stratton programme - I had 1:1 sessions with a health visitor who trained in Webster-Stratton, and I've picked the elements that work/worked for us. Our primary mental health worker from a CAMHS team that deal with ex-LAC children also supports me in using timeout for the two issues we use it for. Can you give me some ideas of strategies to use instead? Are your health visiting team from adoption support? Do they understand the issues that face adopted children? In any case, I am still amazed you have been told to use timeouts. This article is about timeouts, but there's loads of other brilliant stuff, including practical solutions. I can recommend many other books and resources if you're interested. I realise you're coming up against some challenging behaviour, and obviously I don't know you or your child, but I truly think that using timeouts, happy/sad charts and other methods to gain obedience will only make things worse. They make children feel bad about themselves, likely one of the causes of the challenging behaviour in the first place, and only add to the feelings of insecurity that are causing them to try to control everything. It also breaks down parent/child connections - another major cause of difficult behaviour. 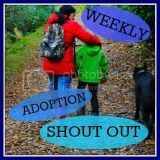 As an adoptive parent, you're already up against it in all these departments, but this is all the more reason to use 'connecting' reather than 'disconnecting' methods. Have you tried time-in, or Theraplay? Could write a lot more, but don't want to go overboard! Really hope some of this helps. I know it's not easy! Hi again, thanks for coming back. No the health visiting team are not from adoption support, and we no longer see them as Mini is too old for us to be involved. We didn't like some of the approaches they suggested, and stopped using them as we felt they didn't understand trauma and the effects of it on young children. In fact, I specifically waited til Mini turned 5, so I could seek help from elsewhere...otherwise I just kept being re-directed back to them. However, some of their strategies *have* worked, and we continue to use them. The CAMHS lady we are seeing however does understand the issues adopted children face however, her specialism being adopted, fostered and 'cared-for' children. I'm not sure how much of my blog you've read, but I do talk about how I use time-in on time-out. Time-out is a space, a safe place for Mini to reflect on just 2 behaviours - screaming and hitting. He is NEVER left alone there, either my husband or I sit with him, sometimes cuddling him if he is receptive to it, verbally reassuring him that we are there. We felt this would help him realise he'd done something wrong, but would remove him from the situation, whilst still showing him that we love him as we'd be there with him. It is also a way of providing a consequence - not necessarily a natural one, but a consistent consequence for those specific issues. We've never looked at our methods as ways to 'gain obedience', but they are ways to teach Mini that some behaviours are not acceptable to us, or society. And our reward charts are to encourage routines and modify behaviour i.e we used one when Mini wasn't drinking enough, he got a star each time he finished a drink, leading to a reward. He now knows that he has to finish his drinks, he just needed a bit of encouragement to do it. We used one to get Mini into the swing of having a wee before going to bed, the promise of a star each time over a few weeks and then a lucky dip was enough for him to get into the routine. He now does it automatically. The stickers make him feel great don't they? They make him feel like he's achieved something...which he has. I notice from your link that you advocate the use of choices to help children comply - unfortunately choices in our house are too difficult for Mini. He cannot make choices, they scare him - he can spend over an hour choosing which DVD to watch, or book to look at. If given the choice to put on shoes or coat first, he just panics, then rages, and ultimately collapses and doesn't do either. Advice from our mental health worker is to remove all choices. And certain Mini has always seemed to feel safer when choices are made for him. I will read both links and your website further and look at the rest of your information and see if we can implement any of it, certainly looks interesting. As for Theraplay, yes we're waiting for it, but Mini is seeing lots of health professionals at the moment for seizures and so it is thought that introducing yet another professional into the mix would make him anxious. I am however attending an adopters training session on theraplay in a few weeks time.